Strategy guides were (and still are) a pretty big deal in Japan. Before the Internet, young Famicom players took to the pages of these compact books to find the best method of conquering the toughest games of yesteryear. We have all sorts of online game references and walkthroughs today, but for the kiddos back then, these books were an invaluable tool. And let's face it, the first Rockman game is pretty tough. 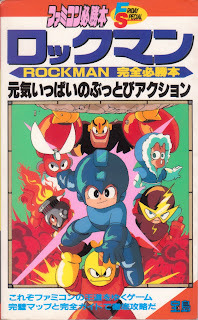 Without the help of the net, disgruntled 80's players had but one quick-fix option: The Rockman Total Winning Handbook. 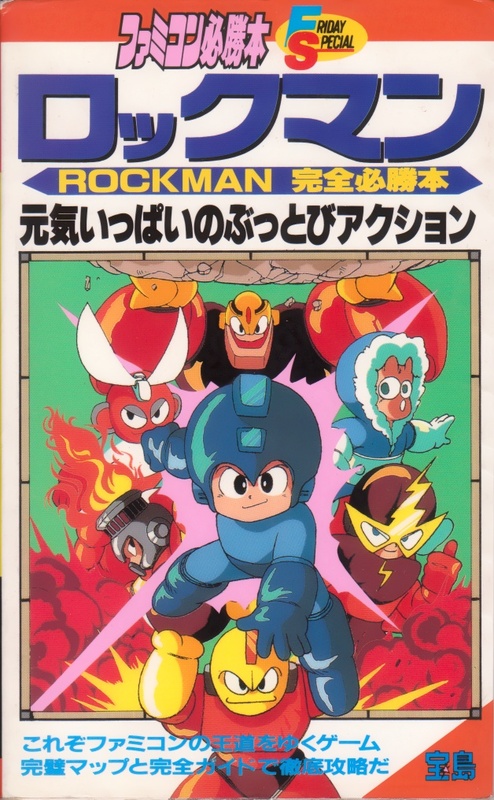 Released in January of 1988, it is one of, if not the first Rockman strategy guide ever released. Decorated in a dazzling manga-inspired jacket art, this handy guide saved the lives of a great many children back in the day (not really). Today, however, it's a collectors item. If you've got some cash to burn, you'll be pleased to know the book is currently up for grabs at Yahoo! Japan Auctions for 6,600 Yen (about $84.47 USD). Expensive, but hey, it's an ancient piece of Rockman history. To purchase, you'll have to use a proxy service such as Rinkya. Of course, there's additional fees for service and shipping. If you'd like to learn more about the book and see some scans, check out #20's article here. It actually costs 6600 yen, ProDu. stuff like this, i just want to see official art that hasn't been already posted everywhere on the net. like that cover art is AWESOME. the person who does buy it should find the decency in their heart to at least take pics. Though I already have enough Rockman guidebooks for the rest of my life. All of them are on EXE or RnR though! @anon 2:27 AM, I can take pics if you'd like. The inside of the book just shows the map of the levels and official art we have seen before. I'm from the pre-internet generation that relied on guides, rumors and friends to get through their games, so I can totally appreciate this. I imagine this guide saved the EXTRA lives of many children. And yeah, Rock's head looks amazing there. Rockman there is just so irresistibly adorable. Man, their strategy guides were so much better than the ones we had here in America. Castillero: ah really appreciate it! but if it's just official art we've seen then you don't have to go to the trouble :] thanks though! awesome, I'm a big fan of the japan game guides because of all the cool artwork in the books. I remember 5 years ago one could pick this guide up from ebay for $20-$30, the prices on all of the rockman guides have sky rocketed in the last couple years especially on ebay.